We may--finally--have found a wireless company that works for us. It's no secret that I've been pretty unhappy with our cell company options of late. We've done plan and no plan companies, various fairly crappy phones, and spent a lot of time calling customer service centers in Bangalore. . . . .In general, I've been really peeved at the cost to service ratio going on here. Living on a boat, our choices are, in general, cellular or. . .well. . . cellular. Signal is iffy down here on the river, data costs expensive, and frankly, living on an artist's income, money is an issue. So after dealing with one you-name-it cellular plan after another, I stumbled onto Republic Wireless on them interwebs, and was rather intrigued. Republic has only been around for a few years, but what they're doing is decidedly different. Their phones default to VOIP (Voice over internet protocol) calling, as does their data, so if you're near WiFi, the phone calls over WiFi, thereby not using the cell system at all. 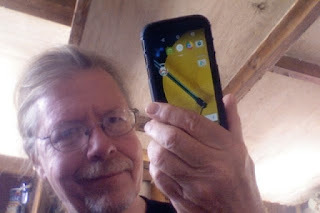 I'd experience using VOIP on the go, using the Talkatone program with an elderly IPod Touch as a phone backup, and knew it worked pretty well, so that interested me. That sounds like a simple thing, and most smart phones can talk over WiFi if you install an App to do so, but the Republic Wireless phone does the rather remarkable trick of being able to switch seamlessly from WiFi to Cell and back, even in mid call. The net effect of all this is that you use very little cell phone time, and are charged accordingly. For most folks, with WiFi at home, at school, at work, and at a myriad of other places throughout your day, this is a good option. For livaboards--most marinas having stable WiFi as part of the slip package--it's a great option, especially since the phone service starts at $5 a month. Yeah, you read that right: $5. $5 gets you a WiFi only service, but with unlimited calling, text, and data over WiFi(and, being a cell phone, you can still call 911 from anywhere, even if you have no WiFi). For $10 bucks you get unlimited calling and text on Sprint's Cellular System, but no cell system data (all of that is, of course, unlimited if you're near WiFi) I opted for the ritzy package of kicking in an extra $7.50 a month for half a gigabyte of cell phone data, with more available if you want to pony up for it. They even go so far as to rebate you for any data unused at the end of the month. I'll be honest, I was skeptical. I'd been disappointed with virtually every system I'd tried, and this just seemed like the next one in line. Unfortunately, my old LG smartphone was dying, I would have to replace it anyway, so I figure, what the heck. . . . The downside of the system is that, since the phones have custom hardware, you have to buy Republic's phones, and the choices, at least at time of writing, are limited to three Motorola Android smartphones: Moto e 2, Moto X, and the Moto e 3 just being introduced. My Moto e 2 ran me $129 plus tax and shipping. The Moto X would run you about $300. All in all not unreasonable. The Motorola phones are actually pretty decent. The phones have nice features, pretty good cameras, and are fairly fast, running video and games pretty seamlessly. The ones supplied by Republic are also mercifully free of Android bloatware, and they have a reputation for being tough. As a plus to those of us living on the water, the Moto's are highly water resistant, and can apparently stand even a brief submersion. I'm not about to test that, but it's nice to know. I opted for a case for the phone because. . .well. . .I'm clumsy. Setting up the phone is a matter of turning it on and giving it a little info about your wireless connections. That's it. I was rather surprised. Call quality is just fine, and the phone, does, indeed, seem to switch both voice and data seamlessly from WiFi to cell system and back, even in mid-call or mid-stream. I could actually see getting in trouble with data if your wireless went down and the phone silently shifted your Netflix stream to your data account. You can, however, set it not to do that, specifying that data be "wifi only" if need be. Oh, you also have the ability to instantly switch plans, upgrading or downgrading them (which is unusual) twice a month. Handy if you have a WiFi only plan and then wind up unexpectedly on the road. My final perk on this system came when I got my first bill and discovered that I had, indeed, been credited back $4.20 for my unused data, bringing my $17.50 a month cell bill to $13.30. Not bad at all. There seems very few downsides to the system: Calls occasionally take a bit of time to connect, and I've sometimes had to redial the call to make it go through. Some places that require you to accept their terms of agreement before logging into their WiFi can occasionally confuse the phone (usually it pops up a browser screen automatically to let you do that). There has been some "clipping" on calls on places with poor WiFi and I've had to force the phone to default to the cell system (easy to do). I did note that customer service is internet only, with no voice service available (but frankly that suits me just fine. I've made quite enough customer service calls to India, thank you, and if I never again have to deal again with someone who introduces himself as "Frank" but has an accent so thick even other Indians can't understand him, it will be too soon). But for less than $20 a month for a fully functioning phone that I don't have to watch like a hawk to keep from going into data overage hell, I'm more than willing to put up with those. The Republic Wireless system seems ideal for many of us livaboards with WiFi access, and also a nice option for those needing another line, a business line, or a phone for the kids that won't break the bank. I'll be doing a followup in a few months after we've lived with the system, but for right now, It's well worth looking into. You can get more info at republicwireless.com. New stuff happening over at Grindlebone Village.